As University of Redlands faculty members, what we love most about working at the University is providing students with a personalized liberal arts education—and at such a beautiful campus, too! 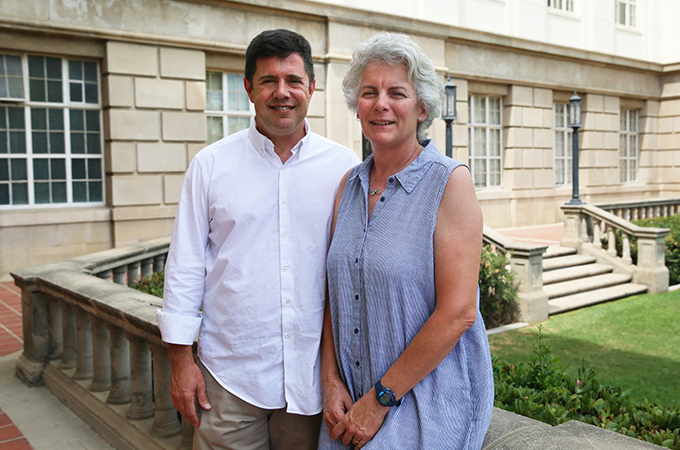 Outside our geographic information systems (GIS) and chemistry classrooms, we have also enjoyed making numerous connections through the Faculty Club, Town & Gown, and other campus organizations. One of our favorite traditions since moving to Redlands in 2001 has been attending the welcome back picnic on the Quad each September. When we meet incoming students at this event, we ask them why they chose to come to Redlands. While their responses vary, many mention how they would not have been able to come to the University without financial aid. We decided to support the Redlands Fund to help make possible those same scholarships that allow these students to learn on our campus. Our support goes back to the 2007 Centennial Campaign, when we responded to an email from a colleague asking us to contribute to the annual fund. Ten years later, we continue to give back because we both share a passion for educating students. We believe in the University’s mission to provide an accessible and affordable education, and we want to support that mission, even beyond our professional work. We make monthly gifts to the Redlands Fund through payroll deduction. It was easy to set up, and we never looked back! Last year, we also supported a crowdfunding project to help send six chemistry students to a national conference. It felt great to read the thank you letters from these grateful students and to know our support directly and positively impacted their learning experiences. This year, we plan to make additional gifts to funds that support our individual departments. We encourage other Redlands employees to join us in supporting all there is to love about Redlands. No amount is too small, as it is together, through our collective philanthropy, that we make a difference. To set up a recurring monthly gift through payroll deduction, visit www.redlands.edu/giving/Redlands-Fund/employee-giving/. Alternatively, you can make a one-time gift at www.redlands.edu/givenow.